Endorphins are created in the body to inhibit pain signals and produce a feeling of euphoria. 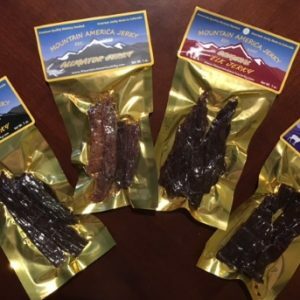 Our Endorphin Explosion Gift Box contains our hottest jerky, it’s sure to please every “chili head”. Get your happy on with Carolina Reaper, Ghost Pepper, Habanero, Jalapeno and Tabasco peppers AND Dark Chocolate! You won’t be disappointed by this heat! Do you LOVE BACON? How about Fresh Hot Crispy Pork Rinds, they only take a minute to cook in your microwave, really! This Piggy Pack gift box is just for you. Our Meat Stick Sampler includes a little bit of everything! Alligator (mild and cajun), Bison, Elk, Venison, Wild Boar, Angus Beef (original and pepper jack), and either Ostrich, Alpaca, or Kangaroo (depending on season). 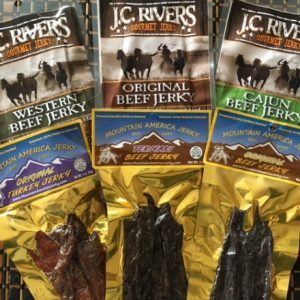 JC Rivers Ghost Pepper Beef Jerky is a small batch jerky handmade from thin slab cuts of top round. These large slabs are easy to tear and chew. 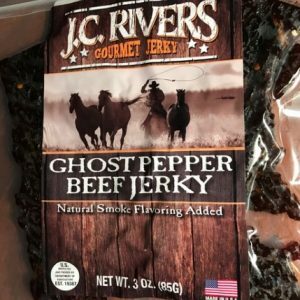 Flavor – smoky beef flavor with an extreme heat level from ghost pepper balanced by a hint of sweetness.